Michael Essien will miss Chelsea's key clashes with Arsenal and Inter Milan due to his knee injury. 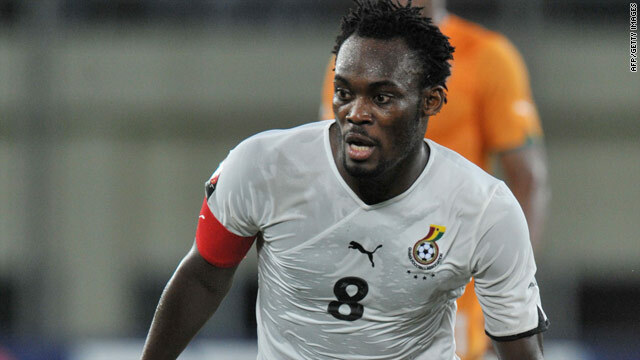 (CNN) -- English Premier League leaders Chelsea expect to be without the services of key midfielder Michael Essien for up to six weeks. The 27-year-old Ghana captain returned to London early after suffering a knee injury during training at the Africa Cup of Nations in Angola. ''He had a tear in the meniscus, and he has to stay out for four to six weeks -- I hope four," Chelsea coach Carlo Ancelotti told the club's official Web site. Big games that Essien will miss include Chelsea's Premier League encounter with title rivals Arsenal at Stamford Bridge on February 7 and the opening leg of the Champions League second-round tie against Inter Milan 17 days later. However, Ancelotti said he would not be seeking to bring in a new player this month to replace Essien, who missed Ghana's opening game in Angola after joining up late with the squad due to a hamstring injury. "In January, Essien was not here, he was at the African Cup. Maybe we lose him for one month. It is not good news but I think that we will do a good job again," the Italian said. Ancelotti is expected to rest key players for Chelsea's FA Cup fourth-round clash with second division Preston on Saturday, with England defender Ashley Cole ruled out with an ankle problem. Ghana's Black Stars qualified from Group B after beating 10-man Burkina Faso 1-0 in their final Group B tie on Tuesday. They face hosts Angola for a place in the semifinals on Sunday, when Group B winners Ivory Coast take on fellow World Cup qualifiers Algeria.